"Guessed half aloud 'milk and water,' 'monthly warning,' 'mice and walnuts' —" fifth illustration by Fred Barnard for Dickens's "The Battle of Life"
Barnard's final illustration for The Battle of Life picks up the story's comic thread as it, like its counterpart in the American Household Edition wood-engravings by E. A. Abbey, depicts Benjamin Britain and his wife Clemency in "A Gentleman Attired in Mourning, and Cloaked and Booted like a Rider on Horseback, Who Stood at the Bar-door" (p. 134 — plate) hosting a tanned, fit-looking stranger who has just alighted from his horse at portal of their inn, The Nutmeg Grater, seeking news of the Jeddlers. As a domestic melodrama, the novella requires the antiphonal comic note provided by the quirky Jeddler servants, Benjamin being the stock type known as the Comic Man and Clemency the Comic Woman of the melodrama, whose class, topics of conversation, and mode of dress contrast those of the principal, bourgeois characters. Barnard's illustration compared to plates by Clarkson Stanfield and E. A. Abbey. Two alternate interpretations of the return of Michael Warden, six years after events at the end of "Part the Second." Left: Clarkson Stanfield's "The Nutmeg Grater". Right: E. A. Abbey's "A Gentleman Attired in Mourning, and Cloaked and Booted like a Rider on Horseback, Who Stood at the Bar-door". 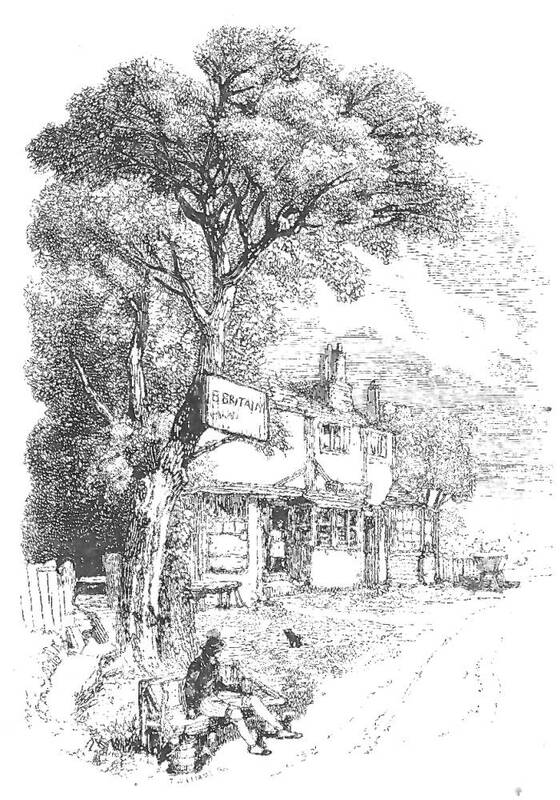 In the entirely new series of illustrations for the fourth Christmas Book, both Abbey and Barnard chose to do more than describe the quaint exterior of Benjamin and Clemency's roadside inn, the subject of marine- and landscape painter Stanfield's third and final contribution to the original programme. 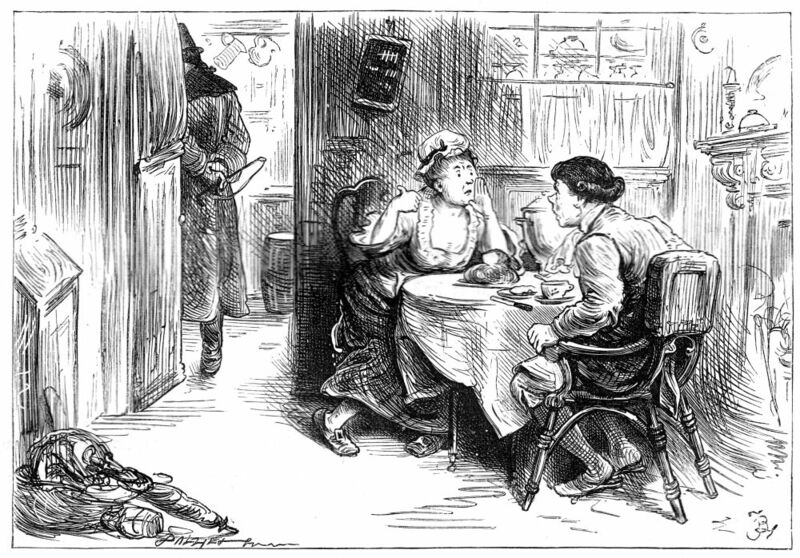 Both Household Edition plates capture the striking moment when Warden returns to clear up the mystery of Marion's "elopement," but Barnard's illustration involves considerably more humour as he places Clemency, struggling to make herself understood, at the centre of the composition, relegating Warden to a half-seen figure in the doorway to the bar-room (upper left). On the other hand, Abbey makes the rider, just alighted from his horse (upper right), the focal point of his final illustration for the novella, framing him in the open doorway. Whereas both Household Edition illustrators show Benjamin Britain in profile, Barnard gives greater prominence to Clemency, as is appropriate since her speech is the essence of the caption. 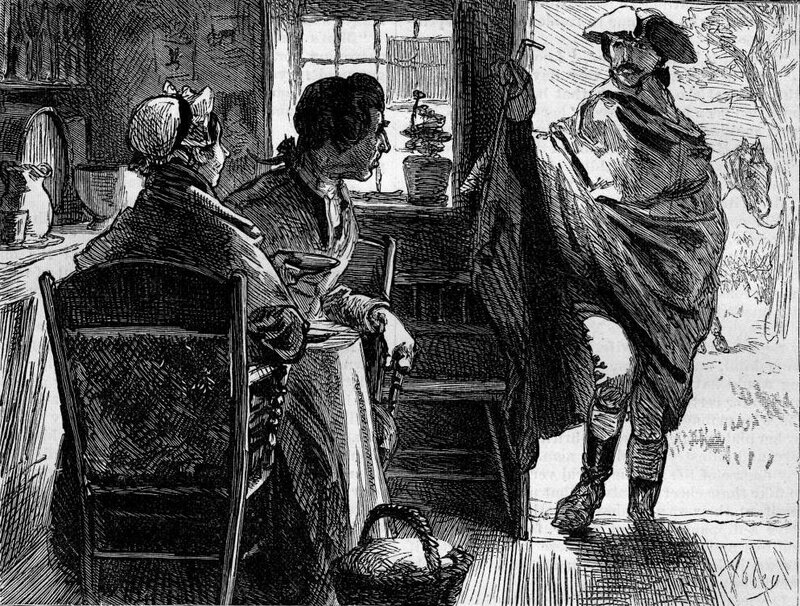 Visual continuity suffers somewhat, however, as this Clemency does not much resemble the character opening the door to Alfred Heathfield in the previous illustration. Whereas Abbey's costuming of the figures is still mid-eighteenth century (note Benjamin's wig, for example), in Barnard's version Warden's riding coat and hat, both similar to Alfred's in Barnard's previous illustration, imply a late eighteenth-century setting. Barnard, too, has more effectively realised the space in which the publicans deal with the visitor, for Abbey's booted-and-caped rider is standing at the couple's parlour door and not, as the text suggests, in the bar-room. Cohen, Jane Rabb. Charles Dickens and his Original Illustrators. Columbus: University of Ohio Press, 1980. Dickens, Charles. The Battle of Life: A Love Story. Christmas Stories. Il. E. A. Abbey. The Household Edition. New York: Harper and Brothers, 1876. Dickens, Charles. The Battle of Life: A Love Story. Christmas Books. Il. Fred Barnard. The Household Edition. London: Chapman and Hall, 1878. Gibson, Frank A. "Nature's Possible: A Reconsideration of The Battle of Life." Dickensian 58 (1962): 43-46. Goldman, Paul. "Defining Illustration Studies: Towards a New Academic Discipline." Reading Victorian Illustration, 1855-1875: Spoils of the Lumber Room. Ed. Paul Goldman and Simon Cooke. Farnham, Surrey & Burlington, VT: Ashgate, 2012. Pp. 13-32. Parker, David. "Christmas Books and Stories, 1844 to 1854." Christmas and Charles Dickens. New York: AMS Press, 2005. Pp. 221-282. Slater, Michael. "Introduction to The Battle of Life." Dickens's Christmas Books. Harmondsworth, Middlesex: Penguin, 1971. Rpt., 1978. Vol. 2: 123-126. Solberg, Sarah A. "'Text Dropped into the Woodcuts': Dickens' Christmas Books." Dickens Studies Annual 8 (1980): 103-118.